Special projects: new solutions for towns! 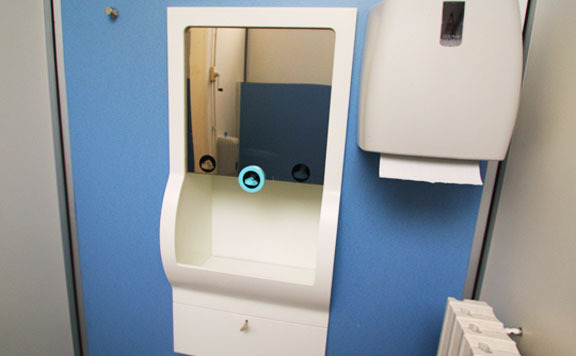 H2air is an automatized and vandal resistant washbasin, with no-touch electronic water, soap and hot air dispensers. Its white composite acrylic exterior finish combines high aesthetic refinement and durability. Carefully designed to guarantee comfort to users and easy cleaning, H2air is an “all in one” integrated solution that ensures maximum performances in minimum space. All its automatic electronic components are protected, wall recessed, and controlled by electronic sensors to avoid water and energy waste. H2air is designed to be employed in motorway restaurants, self-services, restaurants, parking lots, shopping centers etc. H2air “all in one” structure allows a single installation in short and certain delivery times. All it requires for installation is a space in the wall surface, a 3 KW-240v electrical connection, a 15 mm. tube water connection and a 32 mm. drain pipe. 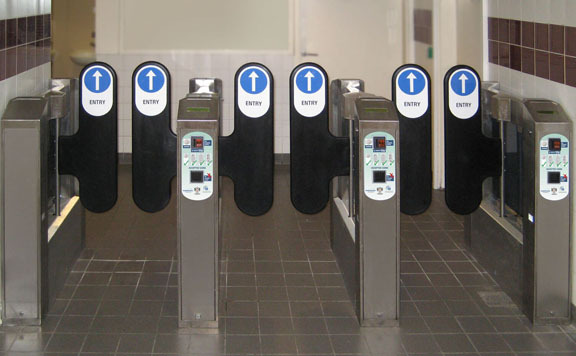 Automated entry system with access control to public toilets, libraries and other public areas. The purpose of the structure is to allow coin-operated entry management or, more simply, to limit the number of people entering an area. Our automatic entry systems, manufactured according to high quality standards, are equipped with an extremely sophisticated passage-detecting program. Designed to have a compact footprint, the entry systems can be fitted in narrow entrances and corridors, while providing a wide aisle opening (520 – 620mm in the standard version). Made of durable vandal resistant stainless steel and tempered glass, our automatic entry systems minimize the wear and tear due to constant contact with the public and guarantee high durability. Responding to the emerging needs of a more rational street furniture, TOILITECH has developed new integrated self-cleaning public toilets equipped with various types of shelters, purification systems, vending machines, and automatic ticket machines. Our many solutions include integrated structures suitable for several uses, with the advantage of avoiding proliferation of street furniture, fragmentation of functions and loss of quality project making. 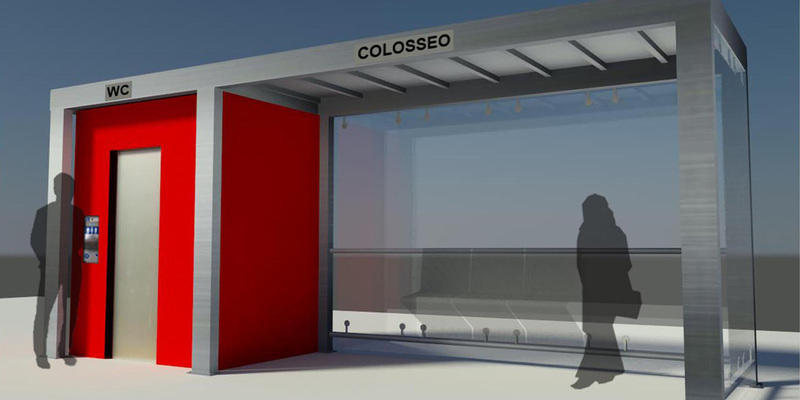 Bus shelters, automatic vending machines, toilets, information points can be grouped into the same area, and our solutions integrate all needed functions into a single structure. 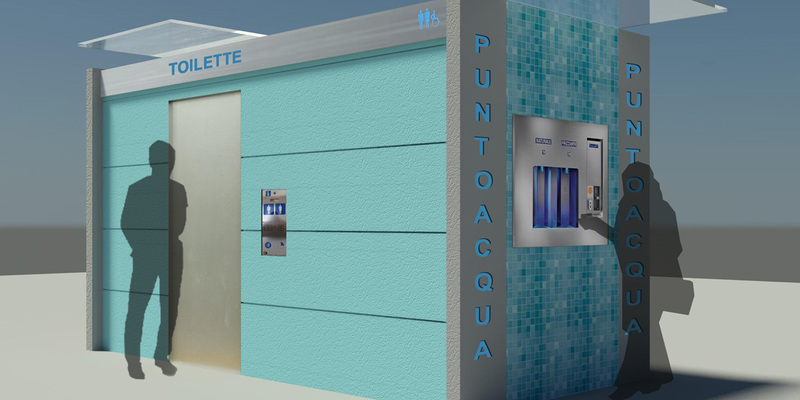 We project and realize self-cleaning public toilets equipped with bus and tram shelters, automatic vending machines (coffee, water, snacks), automatic ticket machines, air filtration systems, electronic information points, and guard booths. Multi-function block equipped with self-cleaning toilet and purified water dispenser. The facility is suitable for disabled persons. The particular design of the single block in reinforced vibrated concrete allows maximum flexibility in finishes and wall colors. Thanks to our exclusive SMART® wash and disinfection technology, TMATIC toilets guarantee the highest levels of hygiene at every use. The standard version includes a hinged door, but the installation of a sliding door is available on demand. Access can be free of charge or pre-paid. A wall-mounted, stainless steel potable water dispenser panel supplies natural or sparkling water. Water counters, programmable by the facility operator, control the water supply. The panel is equipped with a cashbox for payment by coin or re-chargeable cashless key/card, while an alphanumeric display shows information on credit, additional messages, etc.